Holy Guacamole! I've just conquered a battle with a stinkin' head cold that refused to leave this past week and a half! Apologies for being slightly MIA due to it, but trust me, you didn't want this lurgy visiting you! The picture doesn't capture the dimension on this card - it looks much better IRL, honest! The effect was really simple to achieve: I ran the die and card through my Cuttlebug, then didn't move a thing (except for removing the Die of course!) before applying the linen and canvas embossing plate on the same piece of card, and finally teased the sections of the leaf but kept the stem in place. 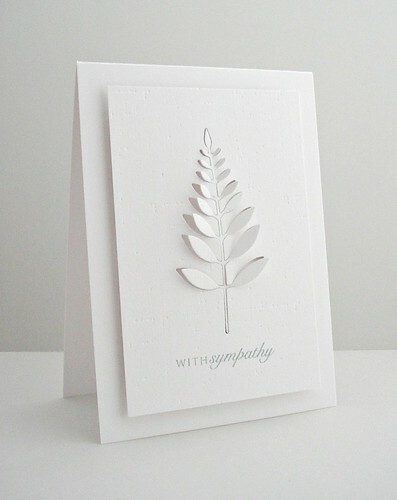 The pure, crisp whiteness led me to stamp a sympathy sentiment on this card. It's always good to have a few in your stash as I'm hopeless at making them on demand! So now it's your turn! Be sure to check out what the rest of the CASE Study DT created from studying Laura's card and then play along and share the inspiration with us! I'm hoping to catch up with everyone and everything now I'm feeling much better but it may take quite a while! In the meantime, don't forget, I have a copy of the March/April issue of Paper Crafts magazine up for grabs so leave a comment here by Friday 11.59 BST if you're interested! WOW! This is so gorgeous, Aimes! I love it! Hope you are feeling better!! it is heavenly. The texture on texture is delicious! nicely done mi new amigo!! what is new in spanish anyway?? it is heavenly! the texture on texture is delicious. nicely done mi new amigo! what is new in spanish anyway? So so elegant Aimes, a truly beautiful effect. I was completely stumped as to how you did it till I read the instructions - very clever. wow, I LOVE this. so elegant, serene and beautiful. Holy moly Aimes. I am drooling in awe at this card. It makes my CAS loving heart SING!! And I mean SING! Wow! Hope you and your gorgeous geek have a fabulous time off together? Staying home or going somewhere fun? Who knew a card with no colour could be so stunning?!?! Simply awesome! Love, love, love, love, love it! Oh and love it some more! Gorgeous Aimes. Such a beautiful and striking card!! this is so pretty - love, love, love it! great inspiration - just put it on my pinterest board! Wow, so striking and elegant. You're a master! Stunning, Aimes! I think my jaw hit the floor when I saw this. I love the use of the positive and negative cuts and all of that gorgeous white! Fabulous way to genius and how in the world did it not fall apart? Simply impressed over here! I adore this card! Wow!! This is absolute PERFECTION! I LOVE this!!! amazing, amazing, amazing, Duchess!! Again, your genius knows no boundaries! Love everything about this! wow what a great idea and such a cool look. Sounds like it was tricky but heh I may have to give it a go.......perhaps!! Simply beautiful, lovely texture on this CAS design. That white on white is stunning!! This is so cool! I LOVE how it is all white. Such a neat technique/effect. Just stunning. Wowwwwwwwww this card is stunning! I just found you through Pinterest... and love your work. And I just bought that die at Harrogate a couple of weeks back, so will definitely be CASEing your card with your permission.. I've also had this nasty lurgy this last couple of weeks... think it's definitely a Yorkshire bug... seems like everyone I know is ill with it! Aimes, I had to come over to your blog and leave a comment here too. I saw this card on your SCS gallery. It's such a beautiful design. Thank you for sharing the technique. Sorry, a bit late to posting my comment but couldn't let this one ride by without a mention. Erm, WOW! One of the most beautiful cards I've ever seen. So many beauties posted lately Aimes but this one just made me say 'wow'!! So innovative and I love the white-on-white!! Perfect!! I constantly spent my half an hour to read this weblog's articles everyday along with a mug off coffee. I know you did this years ago but please, how is the leaf attached? Did you find a way to die cut only part of it? I need a sympathy card ASAP and this is perfect! Hi ... I know this is old but hopefully you will see my question and be able to give me clarification.